Win one of the 100 Steam licenses for GameGuru! 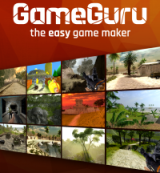 GameGuru is an easy to use, game creation tool for beginners, hobbyists and Indies which allows users to create, share and play their games in a virtual 3D world. It comes with 12 ready to play games, including modern day warfare, horror, medieval fantasy, kids and multiplayer maps. Users can then see what games can be made, and use GameGuru to adapt them into their own creations, making the game unique to them. The free roaming, realistic environment allows users to sculpt terrains, populate them with buildings, game objects and characters and then play their game with the click of a mouse. This great value game maker takes minutes to learn, is powerful enough to deliver a modern gaming experience and allows you to sell what you make royalty free. You’ll find creating and sharing your games both rewarding and lots of fun.